I haven’t written much about Lassie lately, because I didn’t want the blog to turn into a soap opera, but things have changed so much that it feels only right give you an update. She hasn’t been doing well. After her ALT values were slightly elevated about a month ago, we did an ultrasound and her liver looked clear. We did a bile acid assay, which was slightly elevated, but not enough to make a biopsy seem worth the intrusion for a 16 year old dog. She’s gone up and down since then (some vomiting, urinating in the house, but only erratically), and was scheduled for more tests today. But on Thursday she went into free fall. Vomiting, no appetite, looked truly miserable. Tests showed her ALT (a sign of cell death in the liver) to be off the charts. Subsequent tests with an internal medicine specialist showed her to be in a late stage of liver failure. I don’t need to tell you what’s happening now. Most of you have been there: hours on the internet (could it be dental disease? hypothyroidism beside the other obvious things? ), a gazillion meds (antibiotics, prednisone, anti-inflammatories, chinese herbs, SamE, Milk thistle, pepcid), twice daily SubQ fluids at home . We’re going day by day. My vets tell me it can take a long time for livers to recover from whatever assaulted them. (Hepatitis? Toxins? Lepto?). Of course, she could have liver cancer… we couldn’t know that for sure without a biopsy. We’ll continue what we’re doing through the weekend and re assess on Monday. Her acupuncturist is out of the country, so I am looking for another to fill in. We have a lot of decisions to make about how much we are going to put Lassie through, balancing quality of life with information that might, or might not, allow us to save her. Of all the dogs I’ve owned, Lassie is the most fearful of pain and discomfort, and I am clear in my commitment to not take drastic steps to try to save her. Remember the infamous quote from Viet Nam: “We had to destroy the village in order to save it”? Not going to happen to my Lassie. All that was written by my frontal cortex, the analytical part of my brain that is on high power every second now trying to make the best choices that I can. Could I save her if I just learned one more fact? Is there a treatment I’m missing because I logged off of the internet too soon, or because my wonderful vets were tired the day we talked? You know the drill. But, then, there’s the other part of me. I intellectually know that Lassie is 16, and that every day with her in the last couple of years has been a gift. But, oh, I’m not ready. (Picture me SCREAMING that at the top of my lungs, followed by lots of obscenities.) I simply can’t imagine life without my Lassie girl. Her father, Luke, was my soul mate dog, a “one-in-a-million” dog about whom I wrote “I imagine his death to be as if someone took all the oxygen out of the air and expected me to live without it.” He saved my life in more ways than one, and I think that both he and I thought of him as my protector, my home boy who adored me as much as I adored him. Pippy was my faithful Aunt Martha, the sweet, loving relative you could always count on to take care of others and not worry about herself. Tulip was my clown, my muse and my trickster. God I loved her so much. And Lassie? Oh Lassie. She is the one who needed me, the white-sugar-sweet-soft-wonder dog who barely needed training and melted into my life like a vanilla ice cream cone on a hot day. I’ve written 13 books, and I don’t have the words to tell you how much I love her. I heard something on NPR recently that said we could only remember a string of 7 numbers before our emotional brain took over from our rational brain. For what it’s worth with all the research you’re doing…. Oh, Trisha. My heart is breaking into a million pieces for you and Lassie. I just had to make the agonizing decision to let my beautiful, beloved 11-year old cat, Tessa, go due to kidney failure. She would no longer eat and was slowly starving to death. I could not bear it. This was the hardest decision I have ever made in my life and the hole in my heart is huge. All of us who read your blog and have lost a beloved, faithful friend know what you are going through. oh, I am so sorry for what you are going through. You and Lassie, both. I have been there and have thought the exact thoughts you are having. In the meantime, until you say good-bye to each other, every moment/hour/day is a blessing. I’ll keep you and Lassie in my thoughts and prayers. Hugs and many comforting thoughts to you and Lassie. Oh no. I’m sending strength and luck thoughts your and Lassie’s way. Oh Trish…my heart goes out to you and Lassie girl. Whenever we go through these times with a beloved animal it is devastating yet I feel sorry for someone who never has experienced it. Those who have never felt this depth of anguish have also never felt the immense joy of connecting heart, mind and soul with a dog. So sorry to hear you are going through such a tough time. Oh Trisha, I’m so sorry for you. I hope she pulls through this one, and I hope you make peace with yourself when it’s time to let her go. She sounds truly fantastic, and I wish I could meet her! Oh Trisha, I am so sorry Lassie is not doing well. Sending many happy, healing thoughts your way. It’s never the same, is it? Each dog touches a different level of anguish during this period. Keep researching — it’s the salve to your rational side. Keep loving & touching — it’s the salve to your emotional side. And when it’s time, consider allowing Lassie to cross the bridge at home. When done with compassion and expertise, it’s a gentle time of closure for you, Jim, Will & Sushi. Harley and I are sending strength your way. I wish for Lassie and you peace and comfort and hugs. Be well. I’ve read about your dogs in your writings. I recall you telling the story of how Luke had saved you from the mad sheep Colleen. It really is a shame that dogs have such short lives. Best wishes to you and your dogs. Oh! what can I say except that animal lovers like us have to go through this. I was in tears before I finished reading the post. It just brought to the surface all my pain of having to put down my once in a lifetime dog almost two years ago because of bone cancer. The doctors said that we could amputate her leg and do chemo. That would have extended her life for six months or so, but I chose not to do that just because I wanted to keep her. She just went in her crate and stayed there for her last week. Dogs like this can never be replaced, but we can learn to love others. Five months ago we adopted a new dog, a rescued collie. I love her very much, but she will never replace Nikki in my heart. She does, however, have her own place there. My heart goes out to you as well. I wish you strength and tears, and Lassie freedom from pain. I’ve lost three dogs myself and the decisions we are forced to make are heart-wrenching. Sending light, love, strength and healing thoughts your way. The Shelties and I are sending warm, healing thoughts and prayers for you and your family…especially Lassie. I work at a veterinary clinic and see pets come in sick and hurting every day. Seeing the awful pain and sadness that their “parents” go through with them remindeds me how important it is to hug and cherish our furbabies every moment of every day. And it also reminds me to believe in miracles, because they do happen. Please know that all of us fans are hugging our guys tighter today, while thinking of you and Lassie. I am so sorry you and Lassie have come to this place. While I have no words to make it better, you can take comfort knowing all of us that read your blog completely understand. Many of us have stood in similar shoes. Best wishes to you and sweet Lassie. Keeping Lassie and you in my thoughts through this hard time. (((Hugs))) for both of you. Oh what agony. I’ll keep you in my thoughts and wish strength and grace for you and your beautiful girl. My old man is 12 in a couple months and every day I am grateful for his good health, it positively terrifies me how fast things can change. There is tremendous joy, and tremendous sacrifice, in the love of a dog. but it sure doesn’t make it any easier. Sending you and Lassie strength and love today. I don’t expect this to make things easier, but I do want you to know how much your writing about having a vet come to your home and putting your dog to sleep so that he may stay with you and the other dogs that night has helped me fear that day so much less. It brings me so much peace realizing this is an option for us. Thank you for that gift. And now that I’m bawling, I think it’s time for me and impatient Miss Lilly to go to the dog park. So very, very sorry to read this – it is a heart wrenching time. I hope that you are given the small miracle you long for and have even just a little more time together, but know that where there is the sort of loving bond there is between you and Lassie you will do whatever is best for her if the time should come, no matter how agonising it is for you. You’re making me cry. I’m going to hug my dog now. Best wishes to you and Lassie. I’m lost for words as I know it must not get any easier with each dog. Strength and comfort to you all. Be at peace. Sending you and Lassie compassion, tears and hugs. I am so glad you have each other. My lab Lucy has major liver problems as well and we have done all the treatments (except subq) that you have described above. She is a month shy of her 14th birthday and for the most part after being stable for many years she is now on a long slow decline but is still happy. I have had very good results using the homeopathic remedy NUX VOMICA for Lucy. It seems to really help a ton with the nausea and promotes detoxification of the liver. If you haven’t tried it then definately give that a try asap (health food stores carry it). I would use a 30c potency and give three times daily for three days. Lucy has graduated from monthly divided doses (like that one) to a lower dose 6c daily currently. I also have good results with the remedy Causticum for Lucy. It seems to really help her digestion issues. That is much more of a constitutional remedy though so might not be suitable for Lassie (you would need to research her other symptoms). I give the pepcid twice daily as above which helps and have recently added tissue salts to the regime which seem to help with the acid indigestion. Like you, I know that these are all temporary fixes and that eventually age is gonna win :o( and my heart will break into so many pieces. Until that I will do what I can. I know that the pain meds (previcox) she gets aren’t helping her liver but her comfort is really the most important thing. My heart goes out to you, your family and Lassie …. you are all in our thoughts. Oh Lassie. 🙁 Sending good thoughts to you and healing vibes to Lassie. Winter is hard on older bodies. I think a good Rx for all involved, regardless of the cause or possible outcomes, is more snuggling and the most delicious foods a sensitive tummy can handle. I imagine any way you can brighten her day right now will brighten yours, too–and there’s surely nothing to regret about doting on a well-loved dog. Whatever you do will be best. What dog could ask for a better mom, really? I’m so sorry for you and Lassie. They never stay with us long enough. Be strong, and take care of yourself as well. I’m so sorry Patricia. My parents dog went through this a year ago, so I know how hard it is. I did the same things you talked about questioned and requestioned the vet, internet research a variety of foods. Maddie had good days and then bad days. Take it day by day like you are and let Lassie know you are there for her. She will tell you if it is time and until then hold her tight. Oh dear. I saw the title of your post and thought to myself “oh no” because I remember all too well the fragility of life with a sixteen year old dog. Hugs and positive thoughts to you and your family. I’m so sorry Lassie is not doing well. 16 is certainly an age we can only hope all our our dogs make it to, but no matter how long we have it is never enough. I lost my first dog, Levi, just a few months shy of his 17th birthday, longer than I had ever hoped to have him, but it still was like ripping off my right arm. The good thing is that, while it was terribly painful to lose him, once it was over it was not long before I could think of him with more happiness than sadness, because there were no regrets to be had. I couldn’t reasonably have asked for him to live any longer, and I did take time to appreciate the little moments we had together and store them up in my heart; and we had a long goodbye, longer than I would ever have thought, even at the very end. It is just so hard to love them so much when we are destined to lose them from the very beginning. One thing I always tell my clients that I think helps us to find our way at the end is that our goal is to prolong life, not to prolong death. I think there is a time, when the body has started the winding down process, to accept it gracefully and be in the moment, rather than to fight against it desperately. I think our dogs know this lesson better than we do. There will come a time when you look at her and know that your battle has become to prolong death, and that is when it is time to let her go for a while. I have to believe in my heart that it is only for a while, because there is no way we could bear it otherwise. I wish you peace on the rest of your journey together, however long it might be; you will be in my thoughts and prayers. So sorry Dr. Trisha. The hardest choice is knowing what’s best for our companion animals. I barely know what’s best for me. Wishing you and Lassie peace and comfort in choosing the highest good for all. Trisha, so very sorry to hear Lassie is not doing well. There is really nothing I can say which will help – but my thoughts & prayers are with you & lassie (& Will, Jim & Sushi). Try to be as gentle with yourself as you are with Lassie. The best advice I ever received from a vet when making life saving or life ending decisions: “Let Lassie by your guide, she will show your head and heart the way.”. May God bless the both of you on your journey. I’m in tears too. I have felt what you’re feeling now and the tears welled up as I continued to read but they especially came when I saw her picture. Oh gorgeous baby. Best thoughts to you and Lassie tonight. Your story brings back all the painful memories of every pet I have ever lost. It’s always terribly sad, painful, heart-wrenching, too soon and you teeter between guilt and hope while trying to make the best decision for your pet. You will know what to do when the time is right, Lassie will tell you. She’s a lovely dog. “melted into my life like a vanilla ice cream cone on a hot day”… i think those are the words. they’re beautiful and capture her essence perfectly. As if I have met and lived with her myself. Sigh. This is the part about having dogs that I dislike. It’s never easy. Our warmest wishes for you and your family’s comfort in this difficult time. Blessings to you and dear Lassie during this time. We certainly understand how important certain dogs can be – particularly those special ones that have been with us so many years. We send our best to Lassie. I’m sending hugs and strength. Living with an old dog is bittersweet. We just lost our 18 year old last fall. The months leading up to it were precious and excruciating. But please trust that you will do everything you can and you will do your best and you will love her intensely. What more can we do? Trisha, thank you for sharing this moment with us. Our sympathies, support, and strength are with you. Our 15-year-old Bonnie is in the hospital tonight, getting IV fluids and antibiotics. She went downhill very quickly and we knew we didn’t want her to be put through a lot of “stuff,” but after her blood test showed a very high white cell count, and her other values were fairly normal, our dear vet said, “It’s worth trying.” So now we wait. She has been my constant companion since she was 7 1/2 weeks old, and I can hardly bear the thought of losing her. But I also can’t stand to have her suffer unnecessarily. Oh, how they take over our lives. Amazingly, although I have been reading what you write (and relying on your kindness and wisdom) for years – I just discovered this site tonight. I hope that you and Lassie have more good time together. Gosh she is exquisite. I know you will put her needs first. Sixteen is a good old age for a dog her size- but not an easy time to go through a lot of tampering and trouble. I think homeopathy can be a great help – you must have someone in that field to consult. If not, Dr Michael Dym consults by phone. (856) 629-8375 and/or email: homeopathicvet@juno.com and may be able to help Lassie – whichever direction she is going in. Meantime much love to you, Lassie and your family. She has trusted you all along for good reason. You won’t let her down. I love the way Jane Kenyon describes death – ” a gate we might enter singing”. It is life, too. My thoughts and prayers are with sweet Lassie and you. I wish I had the words to make this easier on you. Thank you so much for being strong enough to write this. Hugs for you all. So sorry your dear Lassie is struggling. Several years ago, my girl Lacie came to the close of her three year fight with congestive heart failure. I spent my last day with her holding her in my lap – talking to her, thanking her, singing songs to soothe her way, and stroking her soft fur as I tried one last time to memorize every curve of her body. These pure gentle souls give us so much. Comfort and love to both you and Lassie. Thank you for sharing her with us all these years. How wonderful that you found each other. Sending you and Lassie love, strength, and comfort. Trish, I hope it helps just a little bit to know how many are thinking of you, knowing how hard this is for you and we are all crying inside about what is going on. It is amazing that this is possible, even if 99% haven’t met Lassie personaly – still our feelings are so true and we all really share and feel being together in these moments. Patricia, I am so very sorry for the awful freefall this surely is. I am thinking of your beautiful Lassie girl, and of you. Dear Trish – my heart goes out to you. A non-dog person could not even begin to understand what we are going through when our furkids don’t do well. Unfortunately our beloved dogs only follow us a short period on our life’s path and help shape us in who we are. Lassie is loved and she could not have asked for a better hu-woman than you. You will be by her side and she will feel the comfort of your presence. I hope she will feel better and continue on being at your side, but it is also a comfort to know that you won’t let her suffer once the time has come. The last labor of love is a very hard one, but we owe it to our four legged friends. Give Lassie a big hug from us all ! So sorry. You and Lassie are in my prayers. I am so sorry, my heart aches for you. Hey Trisha, dont lose your hope. 16? Oh, this is just a fact, she is too young, we know that she will be with us much more time. I’m sure that everything will be all right. Hugs in you and Lassie. I hope Lassie pulls out of this and you get some more time with her. I’m sending good thoughts. Thank you from the bottom of my heart for your support and comments. They are like clear, cold water to me on a hot day. A quick update, before I leave to get more meds… Although Lassie has barely eaten in 5 days, there are some signs of improvement. She looks less miserable, and most importantly, she looks as if she wants to eat. But she takes a bite and then stops. A dear friend came out and did acupuncture based on the points recommended by my chinese med vet, and she made the important observation that swallowing seemed to be painful to Lassie. She took one bite, and arched her back as she swallowed. I didn’t notice myself, I was too focused on her mouth, but I’ve been worried about pain in her mouth for quite awhile. It’s beginning to look as though she wants to eat, but it hurts her to do so (which is different than before, days past she clearly was disgusted by the smell of food.) I’m off to get meds to soothe her esophagus (too many pills? something else wrong? ), going to give her another type of pain med and get injectable versions of some of her meds. We took a much needed break yesterday (saw Avatar…. oh lordy I loved the fantasy animals) but spent most of the evening and all morning on Lassie. I am absolutely sure she is not ready to die. She just needs the right help. If only I can find it . . .
A big support hug from here. This was a very moving post. Stay strong! A little slippery elm probably couldn’t hurt in addition to the other things you are doing. Soothes the mucous membranes. Glad you took a break. VERY glad that she feels better. Good girl, Lassie! Hang in there, Trish. I’m so sorry to hear this. I think I met Lassie when we were out to your house for one of the first Feisty Fidos classes. Hannah, my Rottie/Mastiff mix is also not doing well. Skin cancer that was discovered and removed over the summer has come back, in lots of places. She’s doing well for now, but I know I will be where you are before very long. I thank you for all you did for Hannah … she’s lived nearly 11 years now but even so, it’s too soon. My thoughts go out to you and yours. Good luck on finding the right help for your Lassie. Sending love and prayers for Lassie – and for all of you. All I can do is hug my 15 year old and weep. Strength to sweet Lassie and all her blessed family. I hope you read this soon, I had the same with my 17 years old female Papillon. She was hungry, hesitated to eat untill she could not resist. She took a first hungry bite and after swallowing jumped back frightened and in pain back, hit the wall, a door, ran away. I found out too late, when she aready was dead: it most probably was the enlarged heart that got pressure by the food gliding down the oesophagus. With smallest bits of soft food (minced chicken like a creamy soup out of a spoon?) I could easily have avoided this pain! Please try it with that and handfeeding! Trisha, I’m glad Lassie’s doing a bit better. Sending positive, healing thoughts your way! Trish, these are the times of our pets’ lives that we all dread. I know you are in the pressure cooker right now and I can’t really add anything that hasn’t already been expressed, but I wanted you to know my thoughts and prayers are w/ you, Lassie, & your family. Hoping Lassie goes and stays on an upswing. Animals aging, getting sick, and those difficult decisions we as the ones who love them have to make – the downside of having them in our lives. I vividly recall when my elderly horse’s condition tanked, and the vet told me these were his last hours unless I took him for extensive surgery. (the anger I had towards that poor vet – how dare she come and tell me this was the end of the road – 10 hours ago he was fine!) and I had to look him in the eye and let him go, but not after fighting for a few hours with meds and fluids on the offchance it would help him rally and he’d give just one of the clinical signs to show a turnaround. It didn’t and he didn’t rally, and my head told me that it was time – if I was heroic, I was just delaying the invetible and next time maybe he’d suffer longer without me knowing…but my heart kept saying “what if, lets try, he’s not ready, I’M NOT READY…”. After that night, I planted flowers everywhere in my yard, in pots, in planters just trying to work through the pain in my heart – I can still recall it like it was yesterday and that was many years ago. Here’s hoping your girl improves and continues to share some comfortable days and weeks and months with you. My heart goes out to both of you. So sorry to read this, Trish…it is the hard part about loving these animals. Their life spans are just too short. My thoughts will be with you as you go through those awful decisions we all have to face. I hope Lassie will be able to spend a bit more time with you. So sad–we wish they could live as long as parrots. But if they did, we probably wouldn’t meet the next unique and wonderful dog, the dog who needs us as much as we need him. Devlin the rat terrier (who met you at a book signing) and I send our love. Just spend as much time as you can with your dear girl-she is so beautiful. Trisha, you and Lassie are in my thoughts. Sending lots of hugs and wishes that you find the answers you need. Thank you, too, for sharing such a personal experience with us. This moving post reminds me to enjoy each moment with my pet, and be grateful for what he does well. Take care. Sama and I are hoping and praying for you and Lassie. So, glad she’s feeling a bit better… we are hoping, like everyone here that this is just a setback and that she will rally to stay with you for a while longer. How are Willie and Sushi getting through this? Our hearts go out to you and we are thinking of everything you and all your pets have given us, by way of stories, experience and wisdom. You are in my thoughts. Thank you for your wonderful words of wisdom. Little did you know how much you have help me. You have said everything that is going through my mind as my 9 year old male Boxer recently had a melanoma removed and is getting ready for his second oral melanoma shot this Thursday. He is had been a wonderful friend and has help me through many peaks and valleys in my life. My Mom recently passed from lung cancer. She asked that I not let her suffer and that is all I can think about for my Butch E boy. I want him to have a quality life not quanity. If only we had Hospice for are pets. I will be keeping you and Lassie in my thoughts. 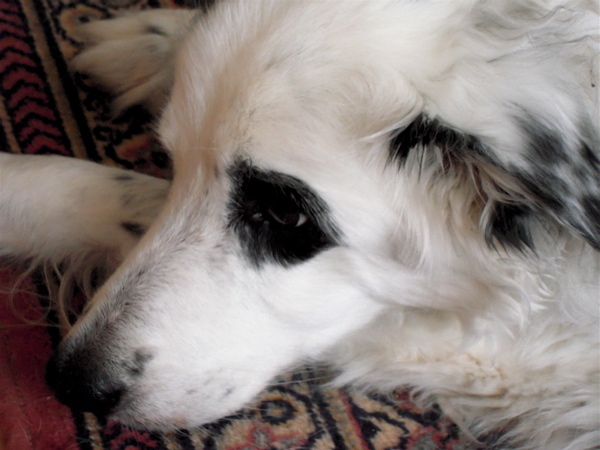 Trisha – So sorry to hear about Lassie; sending positive thoughts your way. Animals we love never leave us ~ they are always with us. My thoughts are with you and Lassie. My son’s cat died two weeks ago after what we think was a tumor in her heart. She’d been sick off and on for months, and finally it reached a crisis point. I had to help him make the decision to not pursue further treatment although she was only11 years old. She died at home and I am so thankful for the compassionate vet who helped us both through such a rough time and helped us know when it was time to let go. This cat taught him so much in her life and truly made him a better person. A true measure of a person is the compassion and care they have for animals. Trisha, glad to hear that Lassie is doing a little better – sending positive healing thoughts your way. I’ve been reading your blog and have been a fan for a few years now. I’m sending good thoughts Lassie’s way. I’ve got an old dog as well. I adopted him from DCHS almost 3 years ago. He was found as a stray and labeled a “senior” but I wasn’t sure how accurate that was, so I guessed he was around 6-8 years old up until a little while ago, when my vet looked at him and said that he really felt like he was 11-12 years old (I’m 24!). I was blown away and instantly started thinking the horrible thought of how much time I would have left with my sweet dog. Over the next few days I realized that I should stop worrying and start playing with my dog again. He is blessed with great health and I’m so lucky that he and I found each other. Best of luck to both of you. We’re keeping our paws crossed. Trisha I am so sorry you and Lassie are going through this it is the hardest part of loving a soul. I know you will make the right decisions about her care even if your heart is breaking. Remember Will and Jim are worried too so let them help you through this time. My thoughts and prayer are with you. Don’t know what words to write to bring you comfort, please know I am thinking of you and Lassie. Sending thoughts of strength and love. We are all thinking of you and sending positive thoughts your way. As I was reading your posts this morning and crying while scrolling through -Harry (Chihuahua mix, you met us in Naples)jumped up in my lap, licked my face and settled with his head resting on my laptop watching the screen. I would like to think this is his way of sending positive energy to all of you. Hope things continue to improve. I am sure she knows you are trying everything you can to make her feel better. I’m thinking of you and your family like everyone else who has fallen in love with your dogs through your writing. Lassie, Luke and Pip taught me so much, through you, about dogs. I wish you peace during this time..
Let myself and Austin, the Sheltiest dog, add our voices to those hoping for nothing but a strong recovery. I’m no DVM, far from it, but Ute’s post makes a lot of sense. Hope that helps. I am so sorry for your pain. I am a vet myself, and this is a long shot, but was she tested for lepto, or is she on antibiotics for it? In some parts of the country it is a big rule-out for acute hepatitis. I don’t mean to make this harder for you by throwing other stuff out there……. You have my most heartfelt sympathy. I loved my Jelly so very much and six months after I am still grieving so I feel acutely for what you are going through and have yet to go through. All my best wishes. I’m so sorry. My thoughts are with you. I hope today brings a better day for Lassie and all of your family. I too and sending thoughts of strength, wisdom, and peace in knowing that whatever happens, you did all that was possible to provide Lassie with the best of care and a life of dignity. Continuing thanks for your thoughts and ideas. She has been tested for Lepto (neg), and is on several antibiotics now in case the liver failure is a result of an infection. I’m taking her in very soon for x-rays of her head and neck (I swear it seems that swallowing is painful, and she takes food out of 1 side of her mouth.. but less so now that’s she getting some pain meds) and a liver biopsy. She is also on 1 chinese herb and is taking SamE and Milk Thistle, along with pred, antibiotics, pain meds, anacids, fluids, nausea fighters…. etc etc etc. I hate the idea of the biopsy, but she just doesn’t seem ready to go at all, and I hate giving her a poly-pharmacy barrage of pills every day (she hates it). I’m switching to injectable as much as I can, but if the biopsy could help us focus our efforts, I think it is worth it. Something is wrong that is compromising her liver, and we don’t know what it is. We may never, but at this point I need more information and cross my paws that the biopsy will lead to no complications and more useful information. Thanks again for your ideas, they are greatly appreciated. Lots of hugs from my house to yours, for both you and Lassie. My thoughts are with you and my fingers are crossed for you and your little girl. Sending lots of hopeful thoughts and golden light your way–feel better, Lassie! Leave it to you to manage to zone in on just the right words to touch in on all the emotions everyone has when facing tough decisions! I’m pulling for you and I understand how you feel. I’ve walked in those shoes and I hate that. Thank you for facing such difficult topics in front of your adoring public and sharing the things that all of us dog owners face, but are often unable to share with anyone. Just this weekend I was both crying over pictures of the special hound I lost a few years ago and laughing with great joy at the hound puppy who was finally able to step into the legacy of huge paw prints that went before him. I know you’ll make all the right decisions at the right times whether its a med choice, a time spent with Lassie choice or a time spent on the net choice. You, Lassie, Willie & the others are parts of so many hearts… love & peace to you. I want to express my well-wishes too. As someone else said to me recently, making medical decisions for our dogs can be way harder than doing it for ourselves. And they can’t tell us their opinions or what hurts! That makes it even harder. I’m hoping for the best for Lassie. She’s come this far and has such great spirit and a million well-wishers. I’m so sorry for what you are going through. It never gets any easier no matter how many times we have to experience this painful process. There is no doubt you will leave no stone unturned in your efforts to help your dear girl. Don’t let the facts overwhelm you though. Sometimes you just have to listen to your heart. I am so sorry to read that you are struggling with Lassie’s illness, and I hope that she can recover. My sympathies are with you, and lots of healing hopes are coming Lassie’s way. Lassie will guide your heart. So many of us have found ourselves in the same place you are now. I found your post on guilt and grieving so comforting after we lost our dog http://www.theotherendoftheleash.com/love-guilt-putting-dogs-down/. I felt so much guilt over her illness and death but reading your words (still) brings tears to my eyes, and I know that we did the best we could. I hope that you can find comfort in them yourself, and remember that no matter what you are doing your best for Lassie. You are heartsick to be sure but while reading through some of your pup’s recent history I wonder if you have considered withdrawing all medications, antibiotics, herbals etc. at this time? The reason being that perhaps one, or more likely, several of these presumed innocent beneficial regimens could have something to do with the continued rapid deterioration. I am an internist and I have all too frequently seen the elderly literally come back from the dead when they are detoxed from their numerous and often cumulatively toxic therapies. Of course this would be an empiric judgment call but you may want to consider it. Also IV glutathione may be another possible consideration that your vets have weighed with you. Don’t give up and keep reviewing your treatment assumptions with those you trust. And consider homeopathy for comfort as well. Remember if this is not her time she will need plenty of time to heal and the hours will turn to days before you see any improvement. My prayers are with you and your beloved lassie. And always consider a second opinion. Through your books and your DVDs, I got to know and developed an emotional connection with all your dogs. when I read your books or your blogs, I don’t just read, I experience and feel every words. When I read this one, I tear up because a gorgeous baby that we all love is suffering terribly and there is absolutely nothing that I can do to help. The roller coaster continues. This morning Lassie and I were walking down the stairs together and she suddenly lept off the stairway like a labrador jumping into a lake. She splattered onto the wooden floor, and badly injured herself. No broken bones or dislocations, but clearly serious soft tissue damage. She is no longer able to stand on her own or walk. I have absolutely no idea what went into her head when she jumped through the air (she looked like a horse jumping over a fence). Needless to say, it changed all the plans for the day. Oh Lassie girl, what were you thinking? Thanks for your posts, and thanks for the comment from Sandra about taking her off everything. I use a lot of homeopathic meedicine, and gave Lassie Arnica immediately after her fall. I’m not quite ready to take her off of everything else, but after a long talk with 4 vets (count them, 4), we’re talking her off all the antibiotics. I’m keeping her on SamE and Milk Thistle, and a few other things. The good news is that her appetite is improved, and she ate pork and beef tonight. (There are better foods for her, like eggs, but right now, any food is better than none and I’m thrilled that she is eating.) Poor girl, she is not a happy camper, and deciding what to do each day is a great challenge (NOT going to do a biopsy now, she is just too weak), but here’s what I am sure of: Today is not the day. Knowing to ask that question every day is keeping me sane. I give my dog boneless, skinless, with the fat trimmed. Simmered until done, then add a spoonful of tumeric. It has many medicinal uses and Sama likes the taste. My prayers are with you and Lassie. Cherish the time she has left with you and I know you will make the right decisions for her. It hurts a lot to read your lines. You had such a wounderful long time with Lassie (and the other dogs) and that’s what counts and should give you some comfort. The memories of the dear 4-paws friends will never die, though! Thinking of you and your dear Lassie. I can only imagine the horror that went through you as you watched her descent. Hold her and try to calm your heart and bank all that love you feel as you do. As you draw on it in the future, you will find it is an account that never diminishes. Remember to comfort Willie. I am certain he understands the battle you are waging. Best to you all. Trisha, I am so sorry to hear about Lassie’s struggle. No matter how often we live through this with a beloved companion, it’s just as painful as it was the first time. Follow your heart. Wishing you and Lassie only healing and happiness. Sending thoughts of strength and peace and clarity and everything that will support you most. Lassie Update: Going to chiropractor mid day today. Am hoping he can help, Lassie is less able to stand than she was yesterday. Won’t eat now. Clearly was badly injured yesterday. Am consulting with 5 vets and many experts, head spinning, but am sure of 2 things: I’m making the best decisions I can, and far more importantly, today is not the day. Thinking of you and Lassie, I had tears in my eyes as I read your post. I am so sorry! I had to let go of my Australian Cattle Dog Amber in November 2009. She was 14 1/2 years old and my BF. I knew she was better off without her hurting body and be a free spirit again. I still cry when I talk about her. I did get a new dog from our local shelter before x-mas. I also bought your book to give her a good start with us as her new pack. They will always be with us but we also have to let them go to complete their journey without us. My thoughts are with you and Lassie. I’m so sorry you are going through this with your precious old gal. It’s so very hard when they can’t tell us exactly what’s wrong or what would be best for them. I almost lost my big guy last fall when he went into an Addisonian crisis (of course, it took a few days to figure that out!) and it was so stressful to see him so ill. Thinking the very best thoughts for you & Lassie. Thanks for keeping us all updated – I so appreciate being part of your journey, as hard as it is to hear. I’m glad today is not the day and I hope tomorrow and the day and week after are not the day as well. May you have peace and find comfort for Lassie soon so she can live out the days she is meant to have, without pain. Of course you are making all the right decisions for your Lassie girl. You’re doing everything in her best interest and you will know in your heart when to say ‘enough’. I hope your visits with the vets and chiropractor today can bring you to a place of more comfort and peace during this difficult time, whatever the outcome of her treatment may be. My love and prayers go out to you and your beautiful Lassie. Wishing strength, comfort, and healing to both you and Lassie. I’m so sorry. Take care and give Lassie a hug for me…..
My thoughts and prayers are with you and Lassie, you write so vividly though I’ve never met her I feel like I know her. Sending lots of positive thoughts your way. I hope that this afternoon’s sessions with the various therapists provided some help and comfort for Lassie and for you. Many hugs for you, Trisha, and licks and tail-wags from my Springers, Ford and Pixie. Like so many others have said, thank you for sharing this oh-so-difficult part of the journey of love. Many many hugs and good thoughts coming your way, to you and your precious Lassie. Oh, man. What an ordeal you are both going through! I’m sorry beyond words. I hope that she improves and you both find some peace in all of this. My thoughts and prayers are with you and Lassie. Thank you for sharing your (and Lassie’s) journey. Anyone who loves a dog either has been where you are or will be there at some point. Hoping the chiro appointment helps and sending lots of positive thoughts your way. I haven’t been able to comment before now. Your news about Lassie came on top of finding out that a dear friend had suddenly died of undiagnosed ovarian cancer and her beloved canine companion a charming Welsh Springer with some serious separation anxiety would be going to the least dog savvy of my friend’s children and that another friend has been forced to reluctantly look for a new home for one of her 2 pit bull mixes since she can’t afford to buy a home and no one will rent to someone with two pit bulls no matter how well trained and mannered they are. I’ve been overwhelmed with sadness from all directions. You’ve been in my thoughts and prayers. I remember the long slow decline of my feline companion and the long talks we had about when enough would be enough. He let me know that he was willing to fight as long as I needed him to fight but that when I was ready to let him go he’d be ready too. So sad and so hard to know when it’s time. Brian and I are thoughts during this difficult time. Teddy Tay is sending many hugs and doggie kisses to her special friend Lassie. Oh Trisha, I am so sorry that you and your baby are going through all of this. Reading about what she’s going through is so heartbreaking. Weird as it sounds, I’ve had dreams about Lassie for the last several nights. You and your pups have taught me so much, and I hope Lassie girl knows how many people she’s inadvertently helped. Good wishes for your whole family. What a lucky girl Lassie is to know such love! You are doing all you can for her, to keep her comfortable and let her know she is loved. Your mind will tell you in which direction you should proceed for her treatments, and your heart will tell you if you should follow that path. Your dogs live a wonderful life with you, and at whatever age they have to leave you, even though it feels too soon, they have lived a FULL life, remember that! You have let them live to their fullest! And NOT just a quantity of years, but a quality of years, a fullness of years, of life lived, of life loved. Remember that in the future, as you are helping your beloved Lassie through her twilight. Thank you for sharing your wisdom through all of your books and seminars, and thank you for sharing your pain, so we who love our animals and feel the pain of losing them know we are not alone. As such, YOU are not alone. Thoughts of peace and comfort to you and your Lassie, your beautiful girl. My thoughts and best wishes are with you and Lassie. This is so hard to go through for any of us. I have a 13 year old Aussie, and I’m thankful every day I still have him too. What can I say that hasn’t been said before. Your heart must be breaking. I know you will continue to follow both your and Lassie’s hearts; together they will lead you where you need to go. Godspeed. So sorry to hear about Lassie and your recent stair event. I might be stateing the obvious but it seems as though she might have been confused. Amonia levels increase with liver failture and can cause confusion quickly. In humans this is treated with lactulose wich unfortunatly causes diarrhea ( the amonia is excreated in the stool ). I wish you the best in this difficult time. I’m so sorry to hear that Lassie is ill and not improving. Stay strong for her. You and Lassie are in my thoughts. My thoughts are with you and Lassie at this difficult time and hoping for a miracle to make her better. Reading these heartfelt messages, I think you must be able feel a big healing tidal wave of love for you and Lassie sweeping up toward Wisconsin … Am sending a little more to help push it along. Trisha, blessings to all of you including Will and Jim and Sushi and the sheep and all the other critters in the area. It is tough on the whole family when one is in pain. Keeping you in my thoughts. I began reading your books, and others on dog behavior and training, as an attempt to distract myself from my heartbreak when my beloved Emma, a 12 year old GSD, passed away last September. Your words had special significance for me as I read about your despair after losing Luke; I had mourned the deaths of my previous dogs, but somehow losing Emma had more of an impact than any of the others. I guess some of it was due to my children being older now (one in high school, the other off in South Africa studying Ecology when Em died), but it was also because Emma and I understood each other perfectly. I feel honored to have been entrusted with her care, and will be forever grateful for the joy she brought to my life. I now have a new puppy, Wiley, who makes me laugh every day. My tribute to Emma will be trying to raise him with the loving guidance that he deserves. Thank you for helping me understand how to do this. Lassie Update: There are endless details, but the bottom line is that Lassie is up and down, but more down than up. Worse yesterday morning (fever – because we dropped out her antibiotics? ), listless, seemed very weak. Chiropractor could find nothing wrong, but she perked up some after treatment and walked a few steps. Looked much better, but wouldn’t eat until she had acupuncture, then ate some beef and pork. I put a moratorium on shoving pills down her throat, carefully decided what meds to give and not to give, turned all into a slurry and fed with a syringe by mouth as a fluid. Hydrated Sub Q. Went to sleep a bit encouraged, but completely puzzled about what’s going on. Liver is clearly compromised, but she doesn’t have the symptoms of total liver failure. Serious injury from the fall that doesn’t show up on x-ray or palpation? Thyroid? Cancer? Much worse this morning, weak and listless. Am trying one more thing related to thyroid, but if no significant improvement by tomorrow, will let her go. Jim dug a grave this morning. This is such a hard time for you, Jim, Lassie and Willie I am very sorry. It looks like you are hoping for the best and prepring for the worst. Even when you know you have done all you could do (and then some), it is not easy to let go and it is so easy to second guess yourself: “What if I had tried …” ” If only I ‘d thought about …” You are all in my thoughts and prayers. I am hoping for the best along with you. After all the things these beloved companions do for us and all the joy they bring us there is one last service we can do for them. Too bad it is such a heartbreaking one. Continuing to hold you all in my thoughts and prayers. My heart breaks for you and your family. May you all find peace and feel the love from all of us on your journey. Jude’s poem sums it up best, but my thoughts and prayers are with you, Jim, and Will. Dr. Trisha. I have followed you and your dogs for years. My prayers are with you and all your family. Have read a number of your books, and recommended them to others. I’ve been where you are and wish there was something to do or say that would make it easier. The one thing I do know is that you will know when the time is right. Lassie will tell you. My heart aches for you. You must feel completely exhausted. What a beautiful life for a dog, to be loved so deeply by you. Sending you love and strength. Up at 4 AM under a full moon, thinking of you and your Lassie girl. I can empathize with what you are going through now. Eight days ago I had to make the heart wrenching decision to put my baby Shelly dog to sleep. I will always remember the joy my little girl gave me, her sweet, innocent, trusting eyes looking up at me, her little tail that curled around itself wagging at me wanting to play all the time. Shelly was a sweet, loving Llasa Apso that arrived on my doorstep when she was 10 years old, and already on medication for Addison’s disease. My neighbor couldn’t keep her, and no shelter would take her. It took one year for me to learn how to manage her disease, with a lot of trial and error. I only had her for 5 short years, but what joy she brought my entire family. Just 2 weeks ago, I learned that Shelly had Congestive Heart Failure, with lots of coughing and difficulty breathing. I put her on heart meds (5 meds in all, including those for Addison’s) when they said that it was mild and treatable. She recovered for a few days on the meds, and then took a turn for the worse one day.. They upped her meds, and then the symptoms returned again. That is when I knew I had to make the decision to euthanize. That was the most difficult decision that I have ever made – She was 15 years young. My friend June says that as soon as Shelly arrived in Heaven, they put wings on her immediately. She was my Angel and teacher on earth. She was one bright light. She was happy all the time, and she lived in the moment. What a great teacher she was to me, I am Honored to have been her caretaker here on earth. She taught me unconditional love. I would have done anything for her, she was love personified. Just a little story: She was euthanized that Thursday morning at 10:30. For 2 whole days, the wind howled, and the snow kept blowing across the highway while I cried and howled from grief. After two days of freezing temperatures and howling winds, I finally sat down to meditate on the loss of my sweet girl. I meditated and prayed, and finally I decided that maybe the wind was trying to tell me something. I listened and heard. The wind was telling me that things were changing. It was change, but it wasn’t bad or good, and so I finally heard the wind and the second I heard its message, the howling stopped, and there was silence. I heard what the wind was saying. And the wind has not howled again since.